Shockingly enough, once I got past my RL petch (whatever it was about), levelling in WAR stopped being so weirdly difficult. Ysharros the squishy Shadow Warrior is now 20 and has a shiny new mount, yeehaw! I also ran into a cool-looking giant skelly that I couldn’t resist taking a tourist picture with. 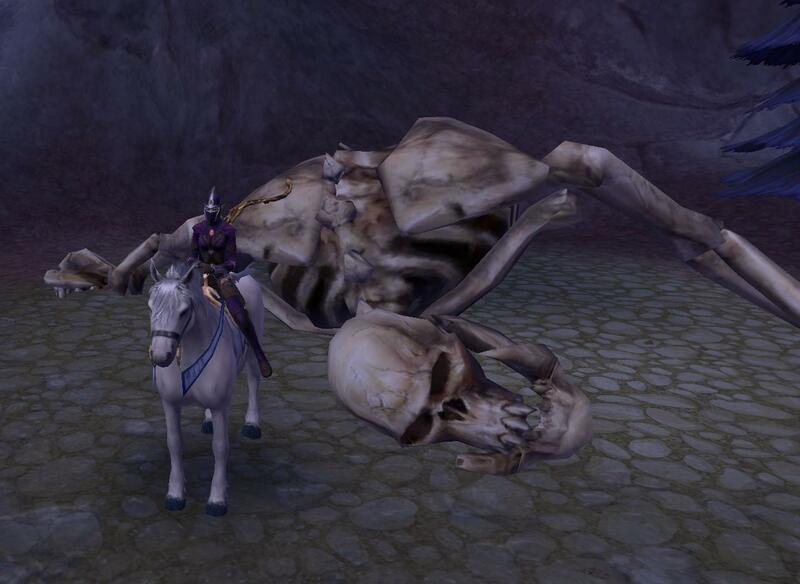 See below for shiny new mount and large dead(er) skelly. As noted by far too many others to link, there’s been a strange slump in the tone of WAR-blogging in the last week or so. Lots of PvE levelling and pacing thoughts, people wondering about burnout, others wondering when (or if) they should start alts, folks liking one activity (PvE or RvR) and not the other — and so on. I’m clearly guilty of that myself. It occurs to me this morning, however, that I sometimes approach my MMOs from the wrong angle. They hold a very large place in my life, true dat, and have done for a decade now — but so did tabletop RPGs. And yet with tabletop RPGs I never expected those games to somehow provide more for me than entertainment. Games aren’t there to provide meaning to life and yet sometimes we seem to get so wrapped up in them that it’s hard to remember. A movie has more of a chance of being a life-changing experience, to be honest. I spent most of last week in a weird funk, maybe due to the big four-oh, maybe not, and a lot of that time was spent wondering why I suddenly wasn’t having so much fun in WAR. As I eventually (finally) worked out last night, it’s not the game, dummy, it’s the player. A game that was fun yesterday and suddenly isn’t today probably didn’t turn into a steaming heap of crapness in 12 hours. Work it out. This doesn’t actually obviate many of the comments made about level pacing — but those are matters of nuance rather than base build, I suspect. I would prefer not to have to travel across pairings to level because I don’t want my million alts ALL doing the same content over, and over, and over. But that’s a personal thing, really, and at least the RvR will always be different. So, yeah. I certainly sometimes seem to expect my MMOs to alter my central moods far more than this kind of entertainment can, until I regain my reason. It’s just a game — there’s only so much it can do for you. Also related, I suspect, is the fact that we’re now a month into launch, give or take. That shiny new game smell is starting to be only a distant whiff, which probably makes many of us game geeks nostalgic and melancholy. The real test, now, will be to see who’s still playing in 2 months, and then in another 5 or 6. Does WAR have enough lasting appeal to keep people playing for 6 months, let alone a year and then some? I think so.